Dozens of southeastern Minnesota residents and campers were evacuated Sunday, as heavy rains swamped roads and sent mud sliding from the area's scenic, rolling hills onto local highways. There were no immediate reports of injuries, said Houston County Emergency Manager Kurt Kuhlers. Two areas in the southern part of Houston County were evacuated. Kuhlers said Sunday evening that the evacuations were voluntary but "strongly encouraged." Later on, an evacuation at Camp Winnebago became mandatory, according to Bruce Kaiser, assistant administrator of the Scenic Bluffs chapter of the American Red Cross. Kuhlers said rain - and lots of it - fell over 24 hours and caused the flash flooding. As of 7 p.m., 3.82 inches of rain had fallen in Brownsville, according to the National Weather Service. Several roads were closed. Mudslides were reported along State Highway 26, south of Brownsville, and mudslides were also reported south of Spring Grove, Kuhlers said. Temporary shelters were set up at the city auditorium in Caledonia and at the community center in Brownsville. At one point, 62 people had been brought into the Caledonia auditorium, said John Allen, a Red Cross official. Another Red Cross official in Brownsville said the center there served eight families on Sunday night. The Houston County Emergency Management Department sent out a civil emergency message shortly after 5 p.m. Sunday advising people in certain areas to evacuate. 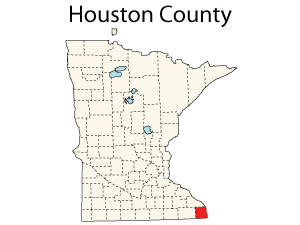 The areas included the Winnebago Valley, Brownsville, and south of Brownsville along the Minnesota state line. The region, which was ravaged by severe floods that killed seven people last August, was under a flash flood warning until midnight Sunday. Gov. Tim Pawlenty planned to visit the area on Monday to assess the damage. Last year, seven counties were declared federal disaster areas after the floods.